This help note provides a step by step guide on how to display, save and print charts. For descriptions or information about the available charts, including chart examples, you should refer to the help note - Chart Descriptions. Select Reports in the Main Ribbon. In the left hand column under the Charts group of reports select the chart you wish to display. The Chart Criteria section allows you to set filters to suit your organisation's reporting requirements. For more details refer to the specific types of Chart Criteria below. 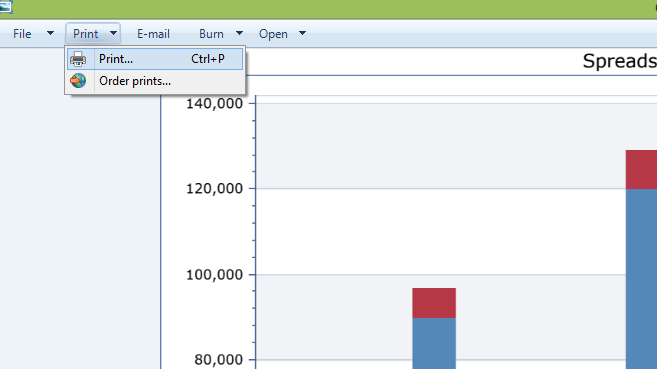 Once you have set the chart criteria, click Display Report to display the chart. Display the chart you want to save or print and click the Save Disk Icon in the upper right corner of the chart. This activates a drop down menu with resolution options. Select what you want to save the image as. 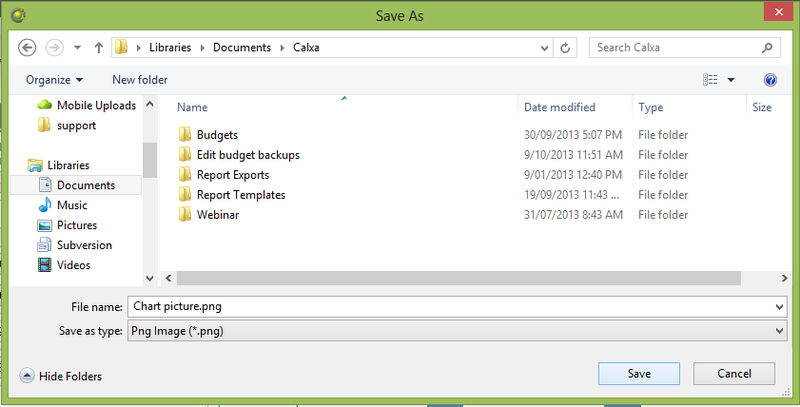 Choose a File name and Location to save the image and click Save. The image will then be saved to that location. If you want to print or include the chart in some other document or presentation you can open the file. 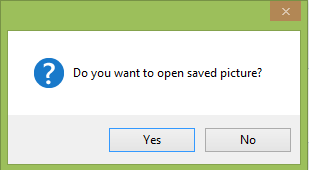 Click Yes to open the picture and No to close the dialog without opening. The image will open in your default application for viewing images so it may differ to the example below. Choose the available Print option to print or Copy to add any other document or presentation. The centre column displays the chart criteria and will vary depending on the chart selected in the report list. Please refer to the Report Criteria section of the help note article – Running Reports, for details on criteria settings. Included below are details on criteria specific to charts. Selected as per the help note article - Running Reports, however it is worth noting that only a single chart can be displayed at a time. As a result, in many charts, the consolidation settings in your business unit selection cannot be applied. Where this is the case, selected business units will always be consolidated to display a single consolidated business unit chart. For more information on this please refer to the help note article - Cost Centre Reporting with Calxa Business Units. The Account Tree control allows you to run the report for a chosen group of accounts. The hierarchical structure represents your chart of accounts. Select a header account from the Account Tree control to display a chart that includes the accounts grouped together by this header. The details of all accounts directly (1 level) below the selected header account will be displayed. 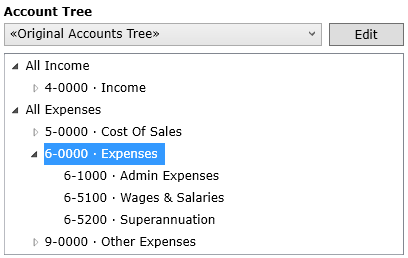 For added flexibility Calxa Premier users may also choose a custom Account Tree from the drop down menu. A custom Account Tree will allow you to map your existing chart of accounts to a new structure and thus group them in alternate ways. For details on creating custom Account Trees please refer to the help note article - Rearrange your Chart of Accounts with Account Trees. For example the selection above of 6-0000 – Expenses will display the accounts details for 6-1000 – Admin Expenses, 6-5100 – Wages & Salaries and 6-5200 – Superannuation. Common settings includes generic filters that change the display of chart elements. Included options are as follows. Suppress Data Labels – When checked Data Labels will not be shown on the chart elements. Suppress Chart Legend – When checked the chart legend will not be shown. Suppress Titles – When checked the report title will not include additional information such as the budget version, business units and accounts used. Suppress Account Numbers – When checked Account numbers will not be shown on the Chart legend or Data labels. Suppress Account Name – When checked Account names will not be shown on the Chart legend or Data labels. Suppress Amount – When checked the Amount will not be shown on the Chart legend or Data labels. Suppress Percentage – When checked the Percentage Amount will not be shown on the Chart legend or Data labels. Creditor Days and Debtor Days – These options override the default creditor days and debtor days calculation and the days count will be applied to all accounts with the Creditor Days or Debtor Days cashflow type. For details on Cashflow Settings refer to the help note article – Preparing a Cashflow Forecast.